Hello everyone! I've been MIA, but truthfully behind the scenes trying to come up with a few reviews and / or minis while having a heck of a hard time getting my thoughts together. So, I thought a "this n that" post was called for since my reviewing mojo has taken a break. Regretfully, the list of books by finalists still sitting in my TBR is longer than the list of books above. It was one of those years. I am going to try to read a few before the winners are announced in June. In February I read a few sff novellas, novelettes, and other shorts works. I reviewed two separately here and here. The two novelettes below are very different in content and structure. I liked one more than the other. Yet, they have something in common. Both stories made an impact and stayed with me long after I read them. 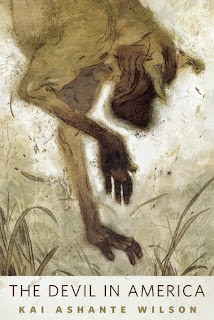 Of the SSF short works I read in February, my favorite was Kai Ashante Wilson's 2014 SFF novelette The Devil in America, a free online read at Tor.com that has been nominated for a Nebula Award. Last year, this author's short story Super Bass was among my favorite. With "The Devil in America," Kai Ashante Wilson introduces fantasy elements while making a strong social statement. He combines ancient African magic with the left over legacy of slavery in America. The central story, where the fantasy elements of the story are focused, takes place in a post Civil War South. Small sections, depicting racially motivated crimes committed against African Americans throughout US history and to contemporary times, are inserted throughout to punctuate consequences of events occurring in the magical section of the narrative. This excellent novelette is short, to the point, and packs a punch. I am also familiar with Dale Bailey's short works through his contributions to Asimov's Magazine. 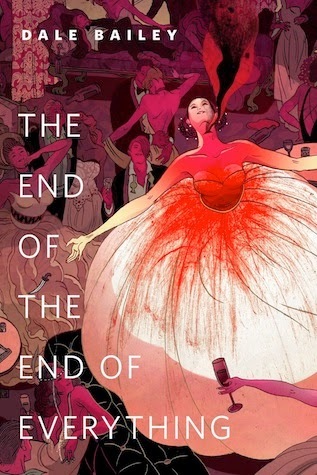 His novelette The End of The End of Everything is not nominated, however, in my estimation it is one of the best I read in February. Think of a dystopian earth where everything in the world is slowly dying from a sort of darkness, described as ruin, that is killing everything it touches: man-made structures as well as all living things, including man. When a couple moves to an exclusive artists' colony with a friend, his latest wife and her child, they find the wealthy, famous, and semi-famous indulging in end-of-world free-for-all dissipation and suicide parties that result in carnage. A mutilation artist becomes the ultimate horrifying temptation for the main character, a philandering poet who questions the mediocrity of his life. This story has excellent sff elements that are utilized throughout the story as a whole. The central character works as both the focus and narrator, and the world-building although murky in its inception, is clear enough for the story's purpose. 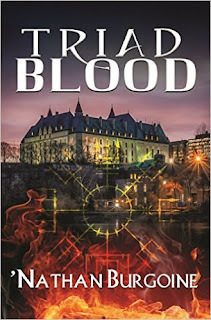 This novelette, however, is sff/horror, one that is filled with the kind of violence, blood, and mutilation that is horrifying and truthfully not for everyone. That aspect of story did not bother me personally. What this very well-written, fascinating novella was missing for me, was a real representation of the psychological torture that the living should have been experiencing. Instead everyone is portrayed as very sophisticated and for the most part clinically detached. Yet, this novelette stayed with me and I will probably reread it. There is so much going on in this story that I may have missed something. Check out that great cover illustration by Victo Ngai! Free online read at Tor.com. 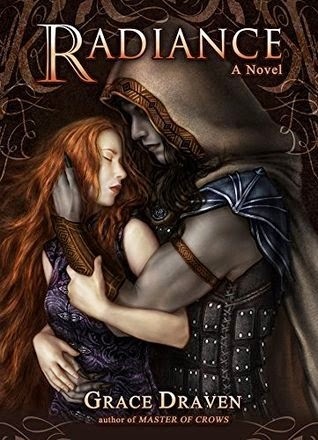 I also read Radiance, Grace Draven's latest release, Part 1 of her Wraith Kings fantasy romance series. Draven's fantasy world-building is as attractive and compelling as her characters. Imagine two cultures and peoples so different in customs and physical appearance that the other appears to them as 'monsters.' Then imagine the royal houses forging an alliance through a marriage where the bride and groom find each other so physically repulsive they have a problem looking at each other without flinching. What are the chances that they will find a happy ever after? This fantasy romance has some gushingly sweet lines between two people who find each other physically repellent. That's because Ildiko and Brishen genuinely like each other from the moment they meet. She drew a circle on his chin with her fingertip. "Your skin color reminds me of a dead eel I once saw on the beach." Brishen arched an eyebrow. "Flattering, I'm sure. I thought yours looked like a mollusk we boil to make amaranthine dye." Draven does a fantastic job of utilizing a growing friendship and understanding as a building block to romantic love. Political intrigue is well integrated with both the fantasy and romantic elements of this novel. But there are also battles of wit as well as physical battles, warriors, magic, dark, light, and more. My one niggle is the overly formal dialog that creeps in between the main characters even during intimate moments. But that was not enough to spoil my enjoyment of this story or the beautiful romantic ending to Radiance. That is until you get to the epilogue, which almost serves as a prelude to what promises to be a more politically complex and fantasy-filled series. I will not miss the next installment. What have I been reading recently? I just finished Vision in Silver: A Novel of the Others by Anne Bishop. More of Meg, Simon, Lakeside Courtyard and Thaisia intrigue. I'm hoping to review this book next week. I'm also trying to catch up with Patricia Brigg's Alpha & Omega UF series and finished Hunting Ground with the hopes of reading books #3 and #4 in March. Maybe I will write one of my series overviews for this one? Let's see if I get going on that! Right now I'm attempting to read a few books: Echopraxia by Peter Watts, a hard sci-fi novel (stuck at 17%); the contemporary novella Snowed In (Kentucky Comfort #3) by Sarah Title(almost done), and We Are the Cloud by Sam J. Miller, a free online sff novelette at the Lightspeed Magazine site (just began). Hey Hils - I love this-and-that posts! I've RADIANCE in my TBR pile, everyone was saying very good things about it. Haven't yet had time to read it though. And those tor.com cover illustrations are gorgeous. Hi Li. I like this type of post too. Sometimes writing it one helps me get on with blogging. RE Tor's cover illustrations: I love them because the art is fantastic and they really capture the stories. I failed to mention that the cover for The Devil in America is illustrated by Richie Pope. Sonia, I think you'll really enjoy Radiance. It's a very romantic book with a happy ever after and a great fantasy world. Hope you enjoy it!